Mrs. Remeta was born and raised in Lima, Peru. 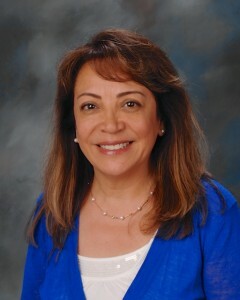 She has been teaching at Palos Verdes High School since 2003. She earned a BS in Architecture in Lima and came to USA to further her studies at UCLA. Prior to teaching she worked for nine years in the interior design field. After having her children she decided to become a teacher. She graduated from LMU with a Masters Degree in Secondary Education. Teaching Spanish is her passion and she is excited to share what she knows as a native speaker. Mrs. Remeta currently teaches Spanish IV, Spanish V, and AP Spanish Language. In her free time she loves to spend time with her family and travel. The Foreign Language Department at Palos Verdes High School currently offers regular, honors, and AP classes for Spanish, French, Chinese, Latin, and Korean. We have a dynamic, creative and experienced faculty of 11 teachers. All of our teachers hold CA teaching credentials and most of them have earned master’s degrees. To fulfill students’ College entrance requirements. To help students become proficient communicators. To gain appreciation of a language and the richness of its culture. To understand the importance of language for diplomacy and cooperation between nations. All Foreign Language classes promote the acquisition of a new language according to ACTFL’s National Standards. Focus on writing and creative expression. Individual and group oral presentations. Cumulative portfolio with self- reflection. Classroom debates and literary circles. Various cultural and artistic research projects. A thorough understanding of other cultures’ products and practices. Use of authentic music and films in the classroom. Important cultural celebrations in Spanish, French, and Chinese. Interdisciplinary correlation through current events and presentational projects. Use of technology to acquire and present information. Research projects to further students’ knowledge in literature, history, geography, social studies, music, and art. Improve student’s understanding of his/her language and culture by comparing it to the foreign language studied. Active Spanish and French Honor Society. Students’ participation in community service projects. Travel opportunities in summer immersion programs. Annual field trips to visit local events, exhibitions, museums, etc.